Is there too much retailing in Bellingham, WA? Do consumers use home equity to maintain spending habits? It would be interesting to study Bellingham's economic base. Where does the money come from to keep the local economy going? One would think that recent layoffs at our pulp and aluminum mills would have set us back. Instead, it looks like the retail sector keeps growing. Where do the consumers get their money from? Savings accounts only go so far. Are they self employed people who work on the Internet? Are there lots of new firms in town? Is there a growing payroll at Western Washington University? Do these things bring in enough money to support all the new retail outlets and housing construction? I would think not. It seems like many folks are independently wealthy from home ownership. Some of these people have retired, but others are well below retirement age. I keep meeting people who are able to coast from selling a house and moving here from another area. Some are able to live off home equity loans. House values rise so fast that a growing segment of the population must be able to maintain consumer spending from their home equity alone. How much of our economy is based on the cash cow of home ownership? Is there too much retailing in Bellingham area ? I am not surprised there are a few empty buildings in downtown Bellingham. Building owners need to update their concepts of what buildings can be used for. It seems like owners are still trying to attract retailing to the area. Bellingham already has more retailing than it knows what to do with. This area seems to have more retailing than the local population can support. Many of the local jobs are in the retailing sector. A snake can not live by just eating its own tail. A coffee shop can not survive by just selling to its own employees. Local retailing was over built when canadians came to Bellingham to shop. Circumstances have changed so people are no longer coming here just to shop. Building owners, and city planners, need to ask the question, "why do people want to come to Bellingham today?" It seems like people want to come here for retirement. Our city gets high ratings, in national magazines, as a retirement destination. Showboat houses for wealthy retirees are mushrooming on the outskirts of town. There may also be a market for higher density condominiums and apartments, in older downtown buildings, for a more urban lifestyle. Office use for the high tech sector also has potential. More recently, than this letter, city planners are wising up. Lots of apartments are being built downtown. With so many folks wishing to move to Bellingham, many bringing their incomes with them, new residences are pouring life into the downtown. Eat in a restaurant being the only customer and having the entire wait staff to one's self. Find a store with 5 check out lanes and only one open, but still no line. A recent Herald article stated that Bellingham has more drive up coffee outlets, per capita, than any other city in Washington state. Chelan Wenatchee 14.23 Small city serves as trade center for large region. Skagit Mt. Vernon 15.55 Next door to Whatcom County. May be over retailed also. King Seattle 16.72 Biggest trade center for entire Pacific Northwest. Whatcom Bellingham 16.87 Canadians used to come down to shop. Now probably overbuilt. Spokane Spokane 17.48 Trade center for area called Inland Empire. * Figures based on US. County City Data Book census figures. Population from 1999 estimate. Number of employees in retailing from 1997 economic census. I divided total population by number of employees in retail for each of Washington's 39 counties. State average is 19.95 people per retail employee. This figure is fairly low due to King County comprising much of the state's population. Counties with large populations tend to have lower figures. Most of the state's counties range between 20 and 40 people per retail employee. The best way to save downtown Bellingham is to realize that there is more to life than just retailing. There is more to life than buying things, but it is easy to forget that in America's materialistic culture. Bellingham has too much shopping. Most of the shopping takes place along the I-5 corridor. The freeway, with its exit ramp malls, has become Bellingham's new retail core. I-5 has become the new "Main Street." It is unlikely that Bellingham's old downtown can compete with the freeway as a retailing core. For downtown to survive, it must find new uses. There are other uses for space than just selling products, even though it is easy to forget that in America. Our lives are cluttered with things to buy, but we lack social interaction. People complain that there is not enough for teenagers and others to do and that housing is in short supply. Downtown could emerge as a center for housing, recreation, learning and office space. If places like the YMCA, and the city library can draw lots of people for something other than shopping there must be more to life than just shopping. This store is now open, spring 2003. From a letter I sent to the city planning department, 2001. Can another Fred Meyers survive in Bellingham? What if there was a town with no industry except Wal-marts and Kmarts and maybe a few houses. Bellingham, Washington? I am not necessarily for, or against, the proposal for the new Fred Meyers in the Bakerview area. But this question should be directed to the Fred Myer's corporation itself. Why would they want to locate another large store in Whatcom County? It seems like the local market is already over saturated with retailing. I have done some research on census information and found that Whatcom County ranks close to the top of counties, in Washington State, for the number of retail establishments per capita. We even rank higher than King County in spite of that region's higher average income. This is a legacy of the years when Whatcom County was a big magnet for Canadian shoppers. The Canadian flow has subsided, but a lot of that retailing remains. There isn't much "basic industry" in our local economy to support all the retailers. Places like Georgia Pacific and Western Washington University, which pump outside money into the local market, are rare. On the other hand, there may be more "basic income" in the county than I realize. Income from retired people, small software type firms and freelancing are less visible. These are important questions that the Fred Meyers people should ask. These questions are also important for the city planning department to ponder, not just related to the Fred Meyer proposal, but in planning for Bellingham's overall retail picture. Figuratively speaking, I-5 has become Bellingham's "Main Street." I-5 is our city's retail core starting with Sehome Plaza, at the south. The core continues through Lakeway, Sunset Center, Bellis Fair and Northwest Avenue. Thus the old "downtown Bellingham" is not that significant as a retail core anymore. This reality should affect our downtown planning, as retailing is less of an option. Other uses for the downtown, such as housing offer more promise. Housing can cash in on income from retirement and freelance work that residents bring with them. Downtown also has potential for location of corporate offices. These activities can bring outside money to Whatcom County. It is interesting to look at the 1300 block of Cornwall Avenue. Lots of empty storefronts, but in the middle of this picture is the glistening headquarters of Dealer Information Services. This picture illustrates the relative futures for retailing and other uses in downtown Bellingham. As for the proposed Fred Meyer's site, itself, I hope we can avoid some of the planning mistakes that took place in the Meridian district around Bellis Fair. If Fred Myers is built, let's remember the importance of pedestrian and bicycle circulation, as well as automobile traffic flow. Pedestrian friendliness can make the area a nicer place to be. At Bellis Fair, I am afraid the environmentalists expended their energy trying to fight the mall in order to save downtown. When the Mall was built, no energy was left to try and make the mall area nice. It never occurred to people that the mall area could be made less frustrating. They could have done a better job with pedestrian and bicycle connections between Bellis Fair and the other retailing in the area. More could have been invested in things like a street overpass across Meridian from Bellis Fair to Telegraph; rather than the intersection. This could have helped tie the area together for both pedestrians and cars. We have a better start in the Northwest Avenue area. Bike Lanes along West Bakerview make a big difference. Northwest Avenue's shoulder width helps connect that area to the rest of Bellingham. As development and traffic continue to increase, I hope we can preserve these features and add to them. Incomes in Whatcom County are lower than in King County. This is not necessarily a bad thing, as money doesn't always buy happiness. On the other hand, people seem to want more money. Things like medical expenses and rents can still be too high. Why are Whatcom county wages so low? Here is one reason for the lower wages. Most of our county's businesses are set up to sell to the local market while King County has lots of companies that sell their goods and services to the world. When businesses like Boeing and Microsoft sell the world, they pump money into King County's economy. We do not have enough places like this. Georgia Pacific West and Alcoa Intalco smelter bring money to Whatcom County. Western Washington University brings money from outside the county also. More of these kinds of places are needed. Most of this area's businesses are built for selling to a local market. We are always getting new malls, stores and restaurants, but people don't travel here, from Japan, to buy a mocha. Local money can only go so far. We need to figure out how to bring outside money into this county if we want incomes to rise. On the other hand, maybe we shouldn't be so dependent on having "more money." A rare snow in downtown Bellingham. With a lot of street trees and old buildings downtown Bellingham has a friendly feel. Downtown is in transition. Much of Bellingham's retailing sprawls out along the freeway while the downtown is starting to get more offices and housing. 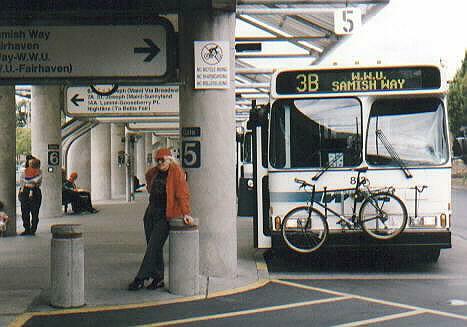 Old picture of downtown transit terminal from 1990s, before the big remodel and the new buses, new bus bike racks and so forth. A friend named Lyle Pearson posing. Parking near Meridian and I-5. The space needs for parking has contributed to Bellingham's retail sprawl. If the automobile could be folded up and placed in one's pocket, when not in use, the space wouldn't have to be devoted to parking and businesses could be closer together; like in the old downtowns. Merchants in the Bellis Fair neighborhood, in Bellingham, seem to do their planning with only two factors in mind. One factor is parking space and the other factor is freeway access. I am convinced that many of those merchants decided, at first, to locate their businesses on the moon because of its undeveloped parking space, but changed their minds when they discovered how far the moon is from the freeway. With parking and freeway access considered so important, pedestrian circulation to and around shopping areas gets neglected. Meridian is one of the few major streets in the city with no sidewalks along much of its length. Poor pedestrian circulation between businesses destroys the sense of "one-stop shopping." People should be able to find a wide selection of goods within walking reach from one-stop, so they don't have to keep restarting their cars and fighting traffic between errands. The Meridian neighborhood, with its busy streets and sprawling parking lots, does a poor job of providing one-stop experience. Bellingham's retailing is sprawling and unfocused so the city is starting to resemble Los Angeles. When Bellis Fair is built, it will try to counteract the sprawl problem by putting a large selection of business in one mall. This might help some, but it would be a lot better if the large areas of business around the mallwere better tied to the mall with such things as better walk ways and possibly an overpass across Meridian.